Marquette is an enjoyable small town with a lively business district, and all the resources you need to make it a base of operations for your U.P. trip. 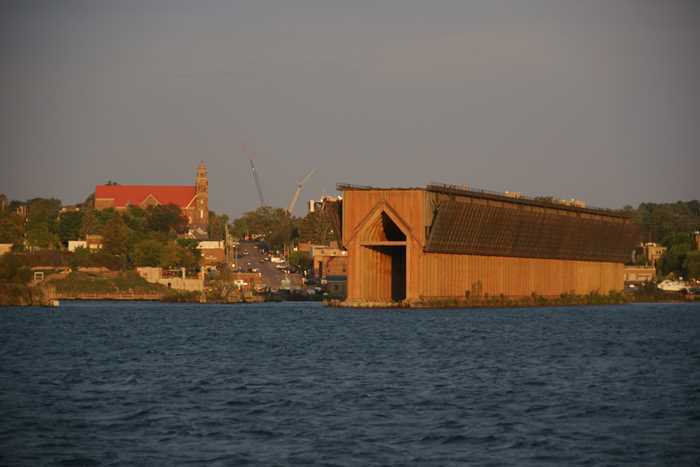 But I’m guessing at some point you’ll be drawn to a very big feature on the city’s waterfront, arguably ugly and beautiful at the same time: Marquette’s Ore Dock. As it turns out, it’s a great place to catch a Superior sunrise. Marquette is located in the Upper Peninsula of Michigan, on US 41, along the southern coast of Lake Superior. You’ll find the Ore Dock at the east end of the downtown business district. From the US 41 roundabout, exit onto Front Street, then take Baraga Avenue down to Lakeshore Boulevard, where you can find some parking near the Hampton Inn. 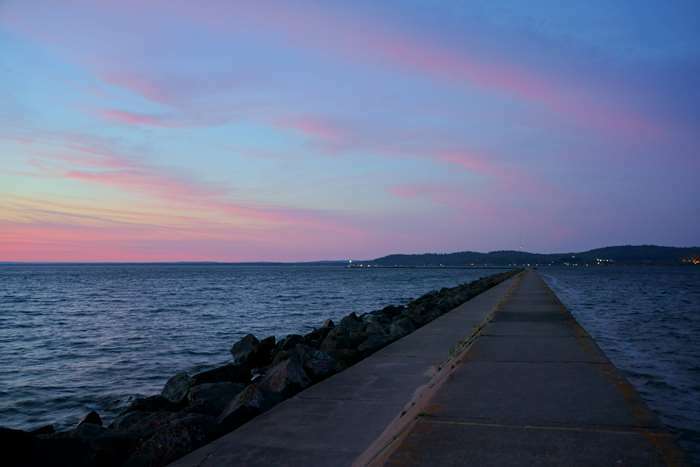 If you’d like to hike out Marquette’s breakwater pier, continue north on Lakeshore Boulevard and park at the Marquette Maritime Museum, or the lighthouse. This hulking structure used to be where Marquette loaded ships with iron ore. Nowadays, it’s just a big ghost-building, but it also provides a great foreground for a photo of the sunrise. 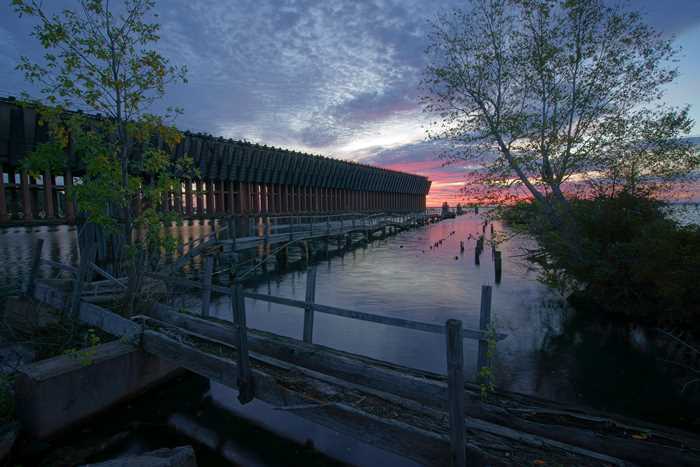 There are some good spots along the waterfront for photographing the sunrise along with Marquette’s ore dock. The best is probably Founders Landing Boardwalk, which is near the Hampton Inn. 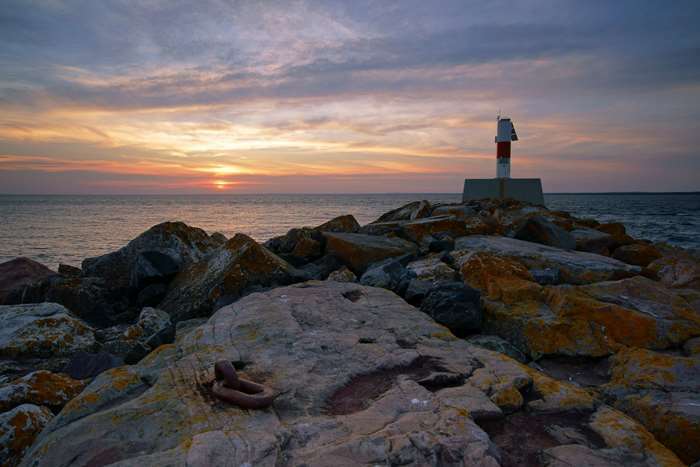 You’ll find numerous good places to watch the sunrise along this boardwalk. The ore dock was built in 1931-1932. It is 969 feet long and 85 feet high. When in use, it had 150 pockets that could hold 56,250 tons of ore. 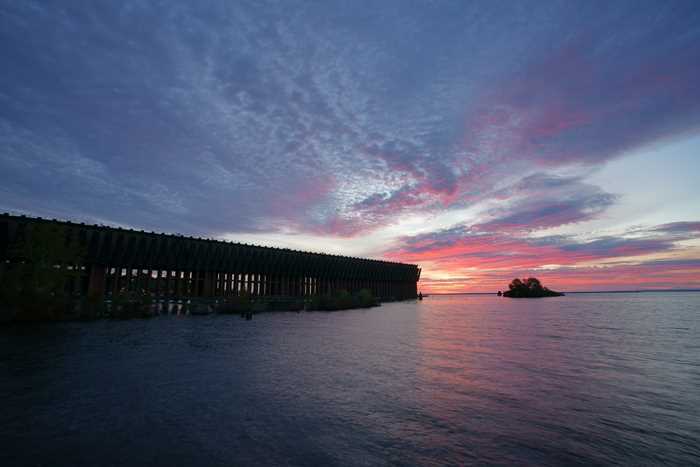 The old Marquette Ore Dock was shut down in 1971, and the approaching railroad trestle was demolished around 2000. 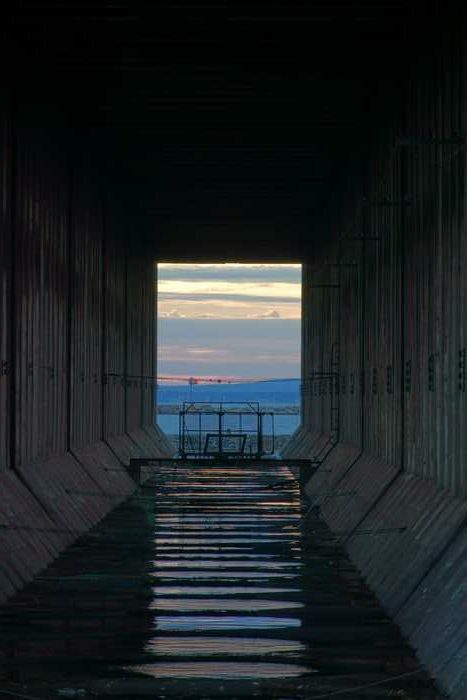 … you can peer down into the bowels of Marquette’s ore dock, to figure out how this structure once functioned. 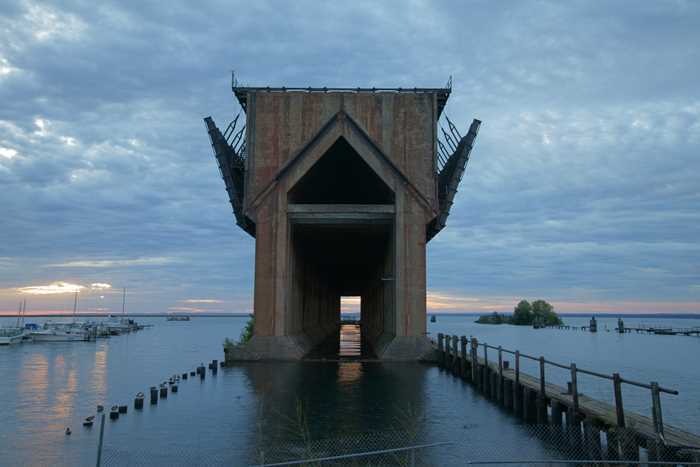 Marquette has another ore dock, north of the old one, near Presque Isle Park. 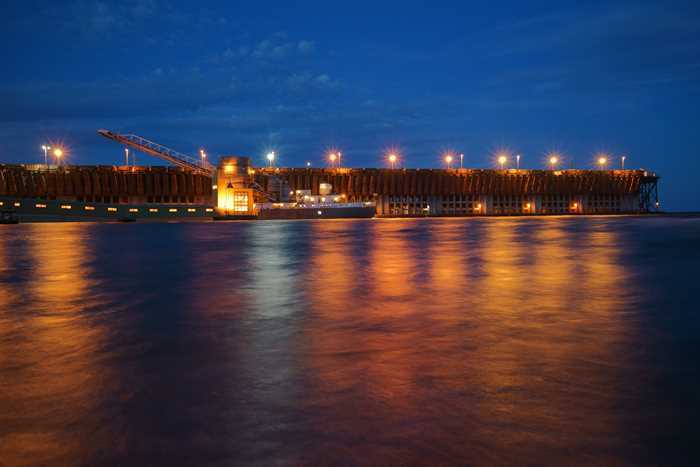 Here, you can watch empty ships arrive and be loaded with iron ore. The ore dock is like a pier for rail cars. The cars, loaded with iron ore, roll out to the end of the pier, then dump their loads into chutes which funnel the ore into the hull of the ship. 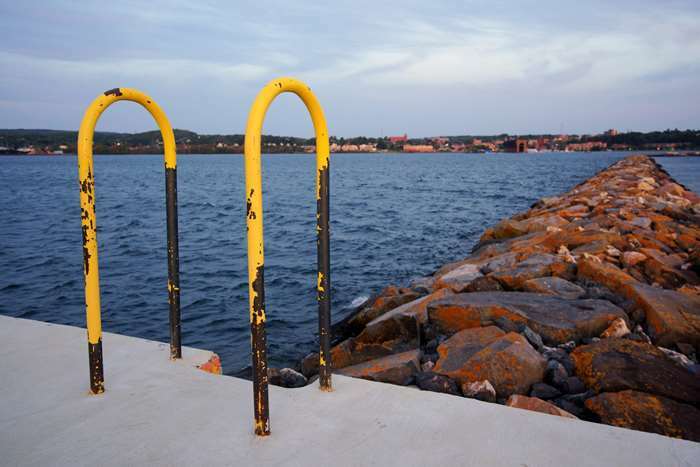 An ambitious plan is underway to revitalize the old Marquette ore dock. The city hopes to eventually open the old structure to pedestrians, enclose and heat/air condition it, and plant a garden on the roof. The entire plan could take 10-15 years to complete. The next morning, I wanted to enjoy another sunrise in Marquette, but from a slightly different location. So, I figured out that I could walk out the long breakwater pier that protects Marquette’s lower harbor. It’s a fun, but slightly dangerous walk that’s perfect for anyone who’s up to a challenge. The breakwater is about 8/10 of a mile long, which is a pretty long walk, when you consider that you’re headed out into the middle of a very deep lake. It’s wide enough to feel pretty safe, provided that the water is calm. 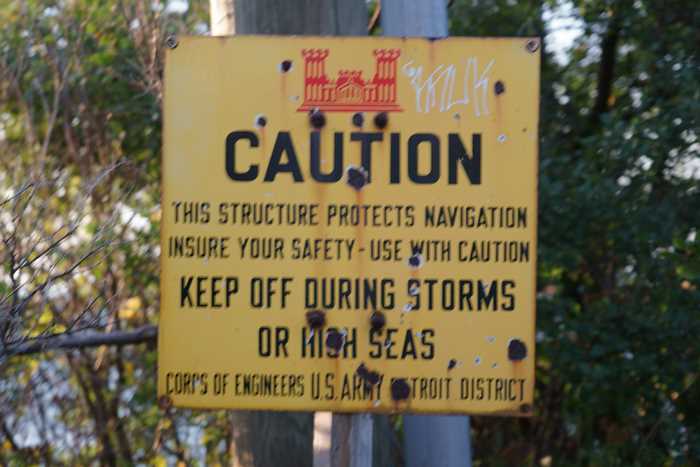 And that’s the catch — you really don’t want to hike out here during stormy weather, as a sign warns. That nice, wide concrete path gets a bit narrower and a whole lot rougher, about halfway out the breakwater pier. When you reach the bend, you’ll have to start hopping from boulder to boulder. It’s still not unsafe, but it does make the hike more challenging. I had reached the end by the time sunrise arrived. Out at the end of the breakwater, there’s a cylindrical lighthouse. It’s not as picturesque as many of the more traditional lighthouses that you’ll find along the Superior coast, but it still feels like quite an accomplishment to make it all the way out here. 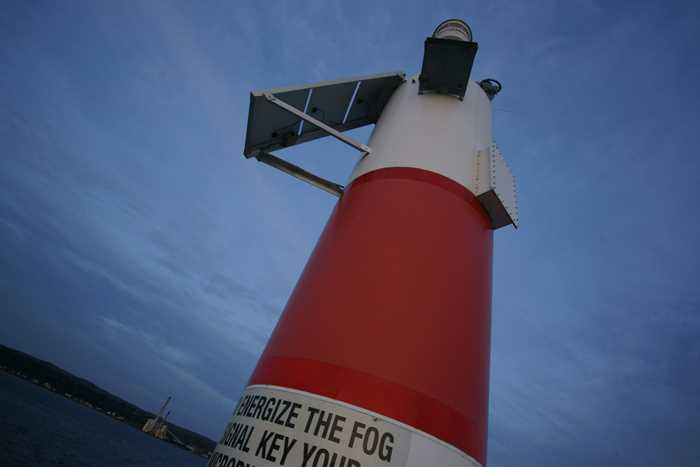 Just hope that no one triggers the fog horn while you’re nearby. An old ladder allows you to climb up from the boulders onto the lighthouse platform. The current cylindrical lighthouse dates back to just 1985. 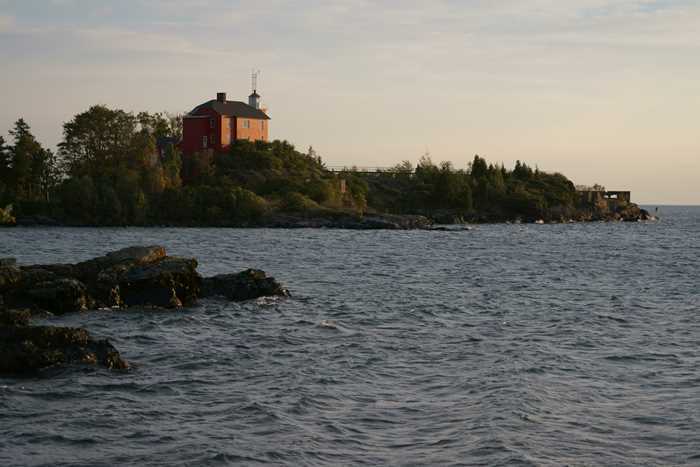 Before that, a square steel tower with a more traditional lighthouse look was positioned here, starting in 1908. Having reached the end, I turned my attention towards the return trip. … you do get a nice view of the lower harbor, and Marquette’s ore dock, as well as downtown Marquette in the distance. And, at the end of the hike, when you’re almost back on land, you’ll also get a nice view of the Marquette Harbor Lighthouse. You can take a tour of the lightouse, but on this trip, I didn’t have time for one. I didn’t get to explore downtown Marquette until it was almost time to leave. But, on Day Four, just before heading west, I needed to find a good place for lunch, and it looked like downtown Marquette had plenty of options. So, I parked and walked around for a while. For lunch, I ended up at Donckers. It’s a Marquette institution, in this location since 1914. There’s a candy store on the first floor and a sandwich shop upstairs. My sandwich was fantastic. By the way, the Delft Theater next-door would also be a good choice for lunch. The 1914 theater is now a restaurant — but it still has a big movie screen above the dining area. 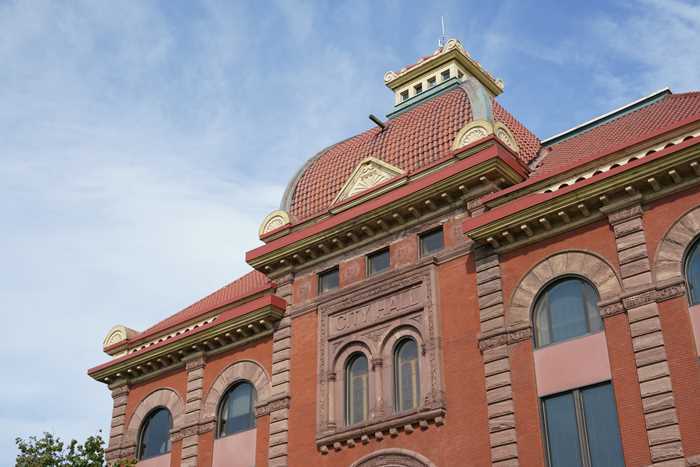 Downtown Marquette has plenty of interesting architecture to check out, including the Savings Bank Building at the east end of Washington Street. The building dates back to 1891. Marquette’s city hall is also quite stunning. It was built in 1895. 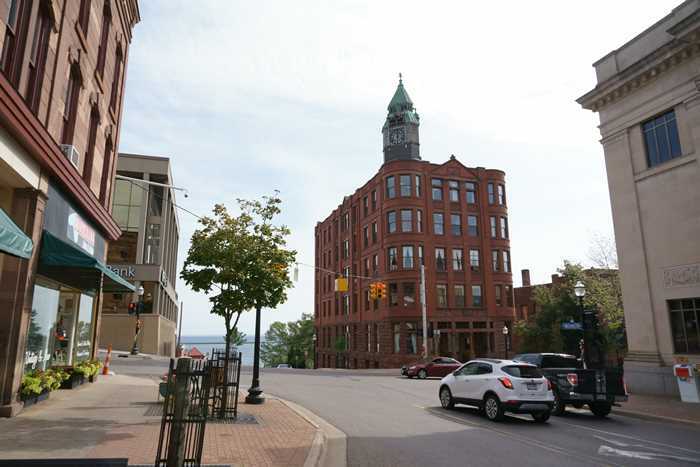 Once I had explored Marquette’s downtown on Day Four, it was time for me to head west towards the Keweenaw Peninsula. But for now, let’s jump back to Day Three, as I headed east to Pictured Rocks. 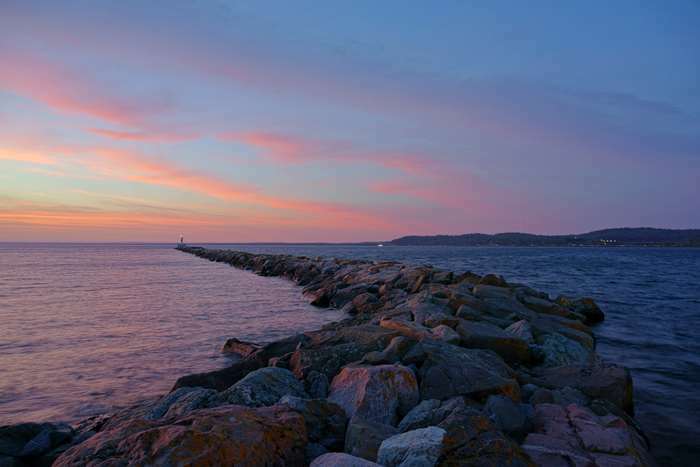 It’s easy to enjoy a couple of days around the Marquette area. 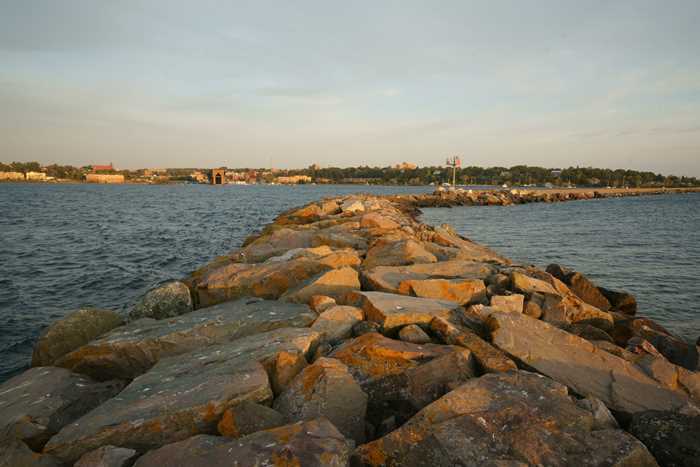 Be sure to check out Marquette’s ore dock, and if you’re up to it, hike out the breakwater. 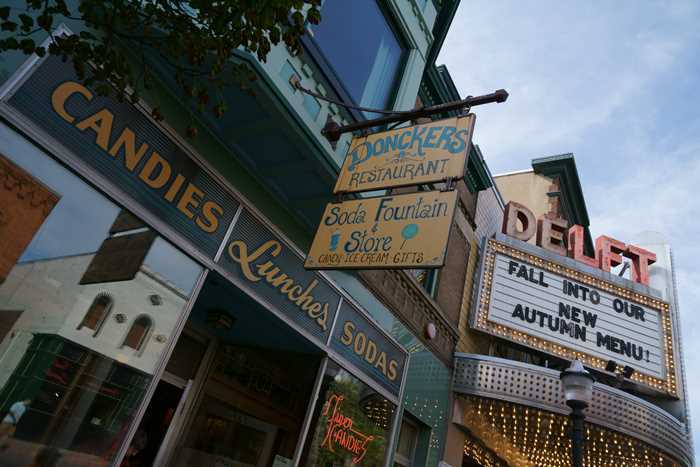 Lunch in downtown Marquette is a great treat, as well.